Tonight, as we celebrate the final night of Chanukah, we’ll admire the full illumination of the chanukiyah, the Chanukah menorah. Every candle will be lit, every flame will be burning bright. Lighting the menorah to its full brilliance is joyful, even though we know it means that the conclusion of the holiday is near. The uniqueness of the commandment to kindle the lights of the menorah is the requirement to first light the shamash, the helper candle, and to use that candle to light others. It is an acknowledgement that sometimes we cannot create light on our own. We depend on others to help us see the light; to help us be the light. That is the essence of community. The beauty of Beth El is our obligation, responsibility, and opportunity to be the light for one another. We are there as the shamash to help you find light during times of grief and mourning, and we are there to help spread your light during celebration. Our community can also serve as sliver of light in a sometimes dark world, standing up for each other — and with each other — in the face of adversity. As powerful as a single candle in the darkness is on that first night of Chanukah, it pales in comparison to the power of the fully lit menorah tonight. 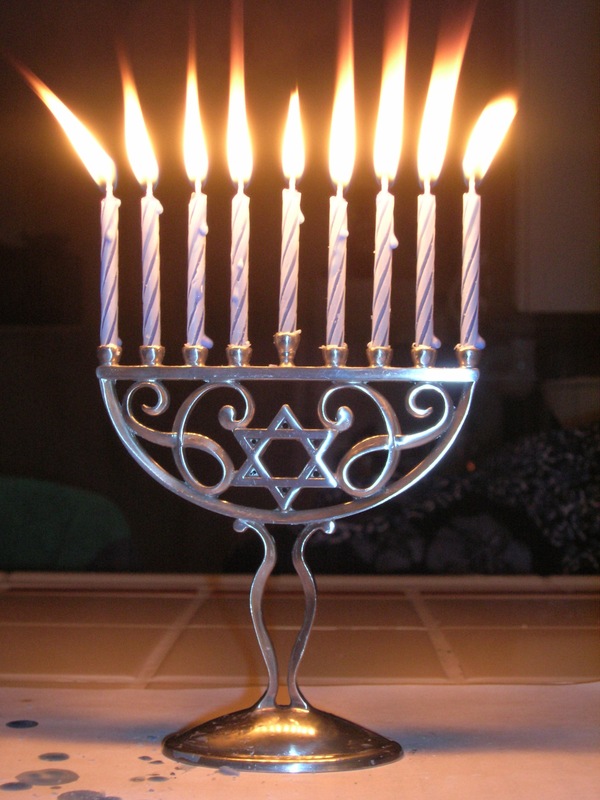 The light of a single flame is increased by the other candles of the menorah. So too, our light — our own unique light as individuals — has the power to light up the darkness. But our own light is increased when surrounded by the light of others. 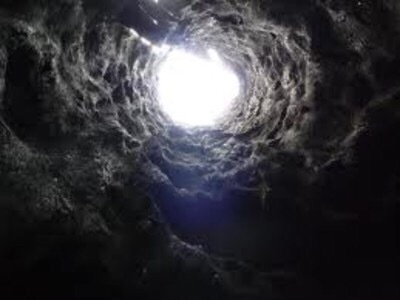 We find that light through learning, and we find that light through witnessing our children learn. We spread that light through prayer, and we find that light through activism. We light up each other as we build community together. 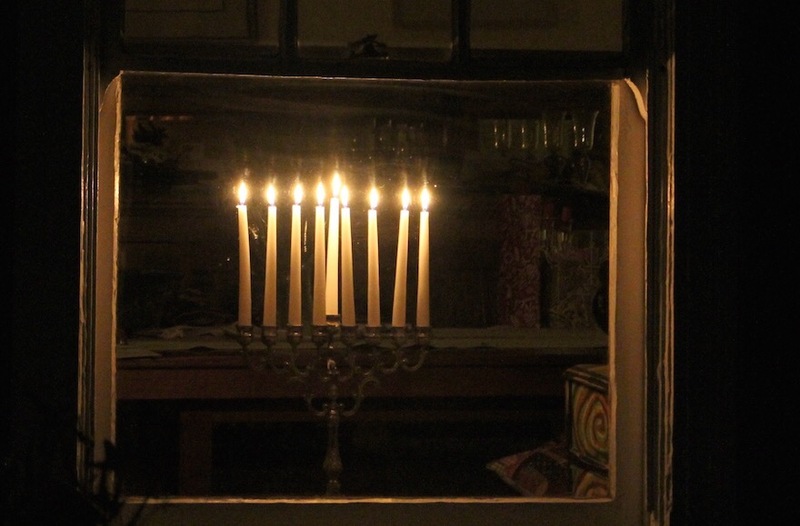 As we watch the candles slowly burn this evening, let us be inspired by the power of the light of a full menorah. Let us remember the power of being unified, of coming together, of being there for one another and knowing that others will be there for us. May the lights of the menorah inspire us to be that light for each other, and may we always find that light in our community. Many gathered around the Thanksgiving table last week grateful for life’s blessings. Breaking bread with family and friends, we were not only thankful for the turkey and stuff, but especially thankful for those in our lives. However, many of us also concluded the Thanksgiving holiday thankful for “surviving” it. We had much to be thankful for, but we survived the great uncle who always says something racist, or the cousin whose world view is completely different than ours. These meals are often like ticking time bombs waiting for one bigoted comment too many to finally cause someone to explode. We fear these holiday meals because we no longer sit at the table with those we disagree with. We share our tables with those who share our values. We don’t have sacred disagreements. They are emotionally exhausting. So we bite our tongues and hope that that xenophobic relative behaves himself. This past Shabbat, when reading Parashat Vayishlach, we read of Esau’s reunion with Jacob. Furious and angry over his brother pretending to be him to steal a blessing from their father, Esau seemed determined to harm and hurt his brother only chapters ago. Yet, upon seeing his brother, and his brother’s family, Esau runs to Jacob and embraces him. They hug, kiss, and weep together. The rabbis go out of their way to be critical of Esau, since Judaism sees him as the polar opposite of Jacob and they try to celebrate Jacob as a biblical patriarch. Yet Esau should truly be celebrated. He is a shining example of how to forgive and not hold a grudge. We should all learn from his example. Still, I can’t help but think that Esau failed in some way. Esau hugging and kissing his brother shouldn’t be that remarkable, but it is because he stays in contact with someone who harmed him. When someone says something offensive, we unfriend them. We block them on social media. We think their views are offensive. And maybe they are. But we never tell them. This past week, as part of the Anti-Defamation League’s Glass Leadership Institute, which I am honored to be a part of, I had the privilege of learning from Jason Sirois, ADL’s director of No Place for Hate. I am proud that we worked to bring the No Place for Hate educational program to South Orange Middle School eighteen months ago. Sirois joked about the all too commonplace “Thanksgiving eye roll,” when a relative says something that is hurtful to you or to someone else — something that is rooted in prejudice or bias — and you just roll your eyes because your family has expected that, well, that’s just how your relative is. And it is easier to ignore than confront. But that’s how we got here. By ignoring instead of confronting. When the leader of the free world tweets such offensive comments so frequently that we’ve stopped calling them out, we just roll our eyes. When people in positions of power have abused their power to sexually assault others, and for too long we have ignored it and not called it out, causing many to be fearful of coming forward, fearing being doubted, challenged, blamed or shamed. We didn’t call it out because we say we like their movies, of that we appreciate their journalism, or we ignore it because they promised us tax cuts, and as a result, we normalize it. We normalize violent behavior and we normalize bigoted beliefs. 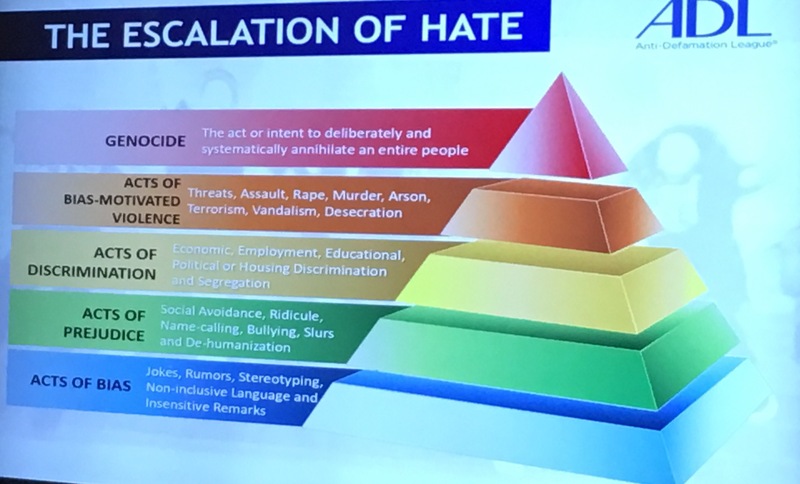 When meeting with Jason Sirois of the ADL, he explained that bias leads to prejudice, which leads to discrimination, which leads to violence, which leads to genocide. So don’t think that ignoring that which is harmful doesn’t have consequences. We must always have room to forgive and believe that people can change. That’s the lesson we learn from Esau. But he still failed because he never called out Jacob for his hurtful actions and words. In fact, even in his initial anger after learning that his brother tricked their father into giving him a blessing, even when he declares that he wants to kills Jacob, the text says Vayomer Esav Belibo, Esau says this in his heart. He keeps his feelings to himself. He never shares his hurt, his heartache, his pain, his anger. He never shares why his is offended. And then he returns and hugs, kisses, and embraces Jacob. Loving family — no matter what — is important. But if we roll our eyes, and simply ignore that which is hurtful to be said and spread, then we are condoning such hate. The Talmud reminds us that silence is tantamount to consent. 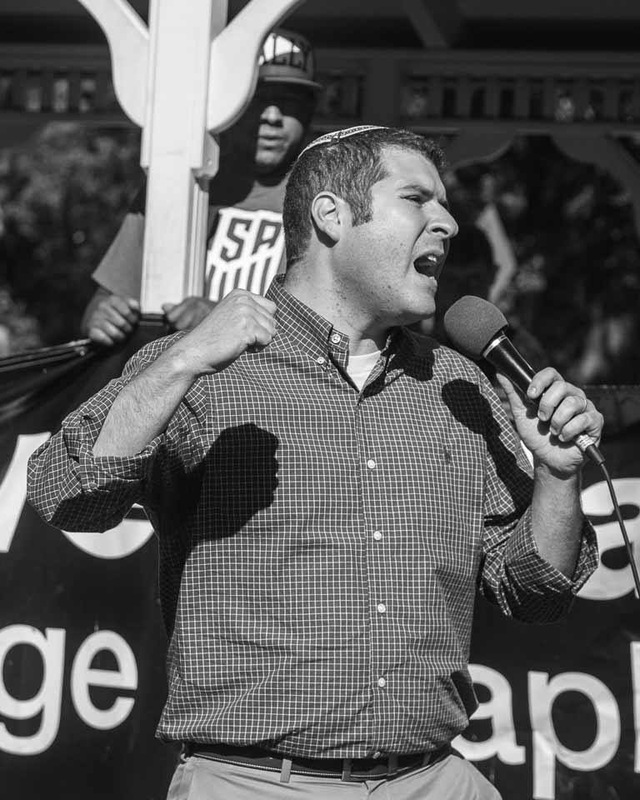 It is physically and emotionally exhausting to call out such hate and bigotry all the time. But ignoring it has consequences and leads to that which is far worse.